"It's hard to imagine what people used to do with computers in those days because by modern standards they really couldn't do anything," said Tom Standage, the Economist magazine's business editor told the World Service's Analysis programme. "But there were still things you could do with a computer that you couldn't do without it like spreadsheets and word processing." Everything from automated spreadsheets to desktop publishing and the rise of the internet have since become possible. 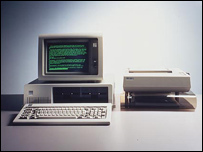 The term PC had been in use long before IBM released its machine - but the success of the 5150 led to the use of the term to mean a machine compatible with IBM's specifications. The machine was developed by a team of 12 engineers, led by Don Estridge, who was known as the "father of the IBM PC". Development took under a year and was achieved by building a machine using "off the shelf" parts from a variety of manufacturers. The machine had an "open architecture" which meant other firms could produce compatible machines. IBM banked on being able to charge a license for using the BIOS - the software which controls the heart of the machine. But other companies reverse engineered the BIOS and were able to produce clones of the machine without having to pay IBM a penny. That open architecture sparked an explosion in PC sales and also paved the way for common standards - something business had craved. Since then the PC has come to dominate the home and the office and led the move to the online era with cheap global communication, e-commerce and for consumers the ability to find the answer to almost any question on the web. Roger Kay, president of computer consultancy firm Endpoint, said the impact of the PC on all aspects our lives cannot be over-stated. "I have for example an archive of correspondence from people that I diligently wrote letters to and all of a sudden that just stops," he said. "I don't think I've got a personal letter for five years." Moving this revolution forward are the one billion PCs that are now in use around the world. In many ways, the PC has become in the developed world, an essential tool in our everyday lives. Ray Ozzie, Microsoft's chief software architect, told the firm's shareholders last month the PC era was coming to an end. "We're now in a new era, an era in which the internet is at the centre of so much that we do now with our PCs," he told them. "And it's important to start then from a different vantage point." With the lion's share of the Microsoft global software empire founded on the success of the PC, Mr Ozzie's statement was a significant admission. Mr Standage said Microsoft has come to recognise that it will inevitably have to move with the times. He said: "The problem is that Microsoft has most to lose from the shift towards internet-based software and that means it has the least incentive to do anything about it because it likes the status quo. "But if it doesn't switch to this new model other people will." The move towards internet based software calls into question the supremacy of the PC itself. Vying to knock the PC off its pedestal are a new generation of media PCs that hook up to televisions and hand-held computer devices, from phones to pocket PCs. With all this small mobile technology and the growth of wireless internet, will people on the move bother owning a PC at all? Reports of the PC's demise may be a little premature. While the market may not be growing anymore, it remains an industry generating some $200bn a year. In developing countries such as China and Latin America, the PC market is still expanding at double digit growth rates. But the development of mobile technology may enable the developing world to leapfrog the PC era altogether. Mr Standage said mobile technology is key to sharing the benefits of the PC age with developing countries. "I think that adding features to mobile phones is probably a better way to democratise computing," he said.